Experience a full day of family-friendly fun with this admission and transportation package to LEGOLAND® California. Enjoy quick and convenient round-trip transport from your hotel to Carlsbad, and spend a full day exploring all that the popular Legoland theme park has to offer. Check out thrilling roller coasters and water rides, watch amazing movies, and see recognizable landmarks made from the famous colorful bricks. Build your own LEGO creations in the Imagination Zone! 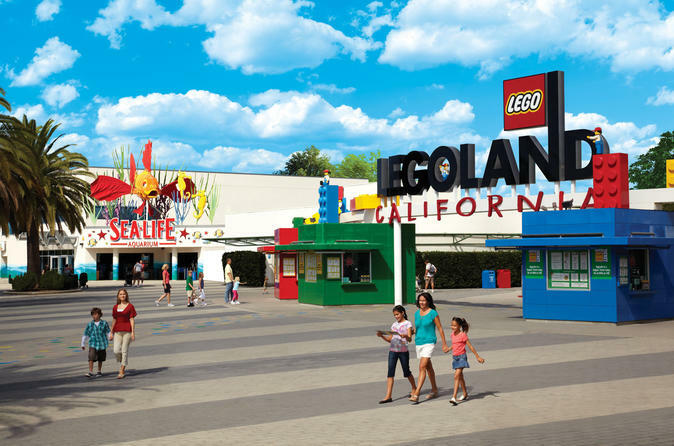 After morning pickup from your Los Angeles hotel or TCL (formerly Grauman's) Chinese Theatre, travel approximately 90 miles (145 km) to Carlsbad and enter LEGOLAND, a theme park based on the famous toy bricks. Visit more than 50 park attractions at your own pace during your nearly eight hours at the park (see Itinerary for select attractions). Afterward, relax and reminisce about the day with your family during the ride back to Los Angeles. Your 11-hour day trip to the amusement park ends with drop-off at your hotel.